This is an ongoing self-education project which may be of interest to those of you who are ink slingers. The idea to start my own style “library” came as a result of trying to determine how various artists communicated similar information to their audience. Learning to first think analytically about what I am being made to see on a comic page and then to think critically about the tools and techniques used to produce that effect can only help improve my own visual communication and expand my “vocabulary”. The artists shown here (Dan Hip, Mike Mignola, Ed McGuinness / Dexter Vines, Eduardo Risso) all employ high contrast that are graphically stylized but utilized different techniques to achieve this communication. 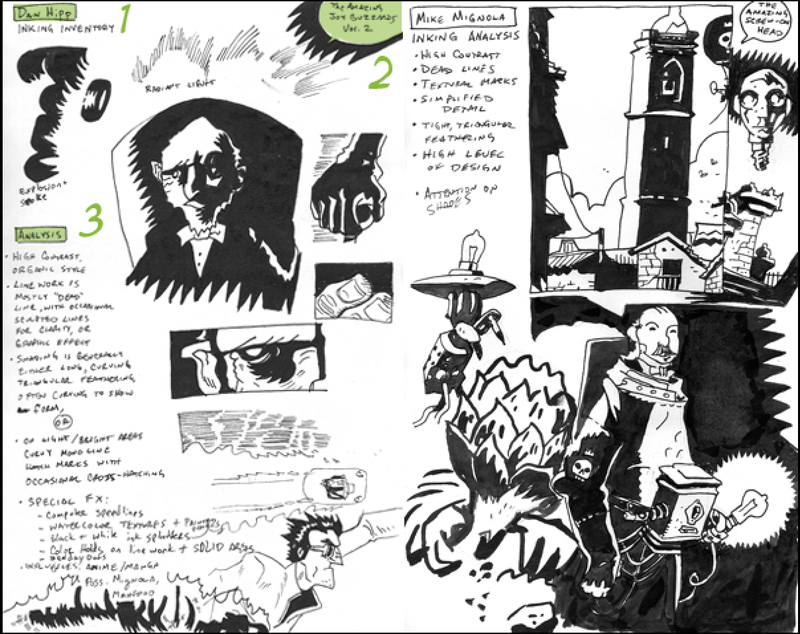 1) I Examine an entire book looking for key style elements & panels that best exemplify them. additional notes- other techniques, white out, razor-blade, zip-a-tone/half-tone effects, etc. cross-references– a short list of other artists who employ similar techniques/marks. 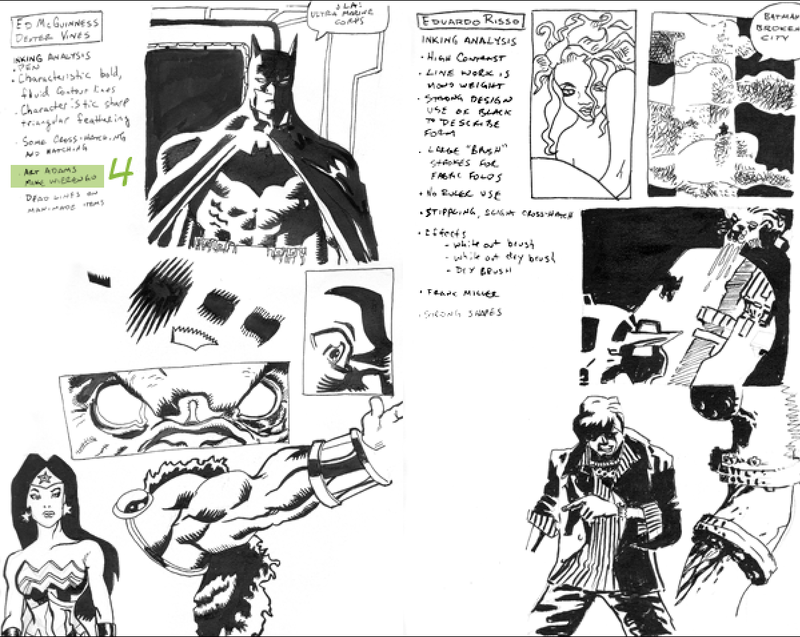 – I Don’t necessarily get bogged down by draftsmanship. I am no neal adams but that’s not the point. – go for variety -American, Japanese, European, various eras & Genres. -if an artist has discussed his work on line, read it before looking at his/her work to inform your “seeing”. -keep separate entries for early and mature work. I think it is helpful to make a sample page from a single comic book rather than make a page incorporating several different books. A separate excercise could then be to compare an artistic style across a career. – keep your personal artistic goals in mind as well as your weak areas — this is a self-critique as much as anything. This entry was posted on March 17, 2012 at 1:35 pm and is filed under Sequential, Tutorial/Idea, Uncategorized. You can follow any responses to this entry through the RSS 2.0 feed. You can leave a response, or trackback from your own site. Good, considered analysis. Wish the pngs were higher res for easier reading.